After being intrigued by Flambeau, I decided to grab a trio of Fabergé fragrances that were part of a cool sixties travel set that included Woodhue (with a cute wooden cap), Tigress (with a kitschy furry tiger-print cap) and Aphrodisia (with a lucite citrine-colored cap). Tigress and Aphrodisia were both originally released in 1938 and I’ll be reviewing them soon. As often happens with vintage perfume, Woodhue's top notes were a bit off, and in this case, initially smelled like hairspray. Soon, a vibrant orange and bergamot came roaring out, the orange note joining with sandalwood and what smelled like cinnamon or ginger, making Woodhue spicy and warm. An hour or so in, a natural vanilla scent blended in with my skin to create an ambrosial, lightly-sweetened milkiness that was so comforting. Occasionally, sniffing my wrist with my nose up close to my skin, spicy orange and jasmine would pierce through the softness like rays of sunshine through a cloud. The rocky road to this dry down is worth it, so if you get some of the old stuff, give it a chance to sputter, screech, and blow smoke like an old jalopy you started up after 50 years of its lying inert. It’ll be worth it once this scent hits its stride and the ride is smooth. Get it on Our Favorite Auction Site (as Olfacta calls it) or wherever you can find a vintage bottle. The Vermont Country Store does not, I repeat, DOES NOT sell authentic, vintage Woodhue. It's their own reproduction. Either believe me, or wade through this exhausting debate on 100perfumes! Fascinating article especially to an English woman who only thinks of Faberge as the ghastly Brut .I love those bottles but suspect vintage Faberge here would be hard to find. This is Angie's daughter Holly. If Faberge ( the jeweller was French ,maybe exiled to Russia via his family escaping the Revolution ? 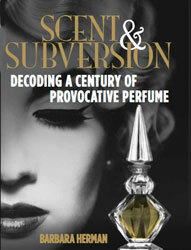 )was the perfume house owned by a Russian exiled family member ? OK, so according to Wikipedia (I know, so Freshman in college of me! ), the link between the Imperial Russian jeweler and Fabergé cosmetics and perfume is only incidental. Basically, billionaire Armand Hammer, who had collected Fabergé eggs, suggested to his friend Samuel Rubin (who was starting a cosmetics/soap company) that he should register the company as Fabergé. So it was a branding decision more than anything. The Russian House of Fabergé didn't find out about this until after WWII, sued Rubin, and settled out of court and ultimately allowed him to use the Fabergé name. For a while, Fabergé was a prestigious perfume brand, and I think that when Woodhue, Aphrodisia, Flambeau and Tigress came out in the 30s - 50s, these were considered on par with Coty, Guerlain, etc. In 1964, Rubin sold the company to a French company named Rayette, so for a while it was called Rayette-Fabergé. In 1971, it reverted back to simply being Fabergé. So where does that leave the scents in these bottles that I have? First off, I they're either from the 50s or 60s. I think Fabergé may have moved on from these scents by the 70s, when Brut forced its way into the world's nasal passages. (It was called "brute" for a reason!) I imagine that they must retain something of their original flavor, but they do combine two (usually) incompatible qualities: they smell kinda cheap and yet interesting, which leads me to believe that Rubin et al must have stuck somewhat to the original formula but maybe dumbed them down a little bit and used cheaper ingredients. Thank-you very much for that ,very interesting. We look forward to what Octavian has to say ,what a nose that man has ! Does anyone have any information on the woodhue one dram gold-colored metal travel case? The design is woven like lattice, the bottom screws off and the glass container that holds the perfume slides out to be replaced. I have one of these and cannot find anything about them online. It is stamped on the bottom: Turn to refill 1 dram, Faberge Woodhue, paris new york toronto. The perfume itself is dried out but the whole thing is intact! Hi Andrea, what are you trying to find out about it? I HAVE the EXACT set of 3 in the same packaging you pictured! I got it as a gift in 1965!They are slightly used. I want to sell the set. Please advise. I've never sold anything on eBay, but I think that's the way to go. Good luck! I wore Woodhue in the 50's. I loved it and would like very much to get more. Does the vintage smell the same as it did back then? Where can I get it? I wore Woodhue in the fifties and some time later. I loved it and wish I could find it again. Can I? Toilet water or perfume. Does it smell the same when it is manufactured these days? It is not manufactured anymore (as far as I know), but you can check for it on eBay by looking up vintage Woodhue perfume. Im sure its there! Hi, can you tell me if and where I might find the vintage Faberge "Flambeau"? It was the very first cologne I ever received from my first love. I would love to find it again if possible. looking for Faberge woodhue cologne in usa. I used Woodhue in the late 70's when I was just a teenager and I loved it! I always received posotive complements when I wore it. I still have the two gold tone metal cases with the perfume bottles. So if anyone out there knows where I maybe able to find "Please let me know! ".